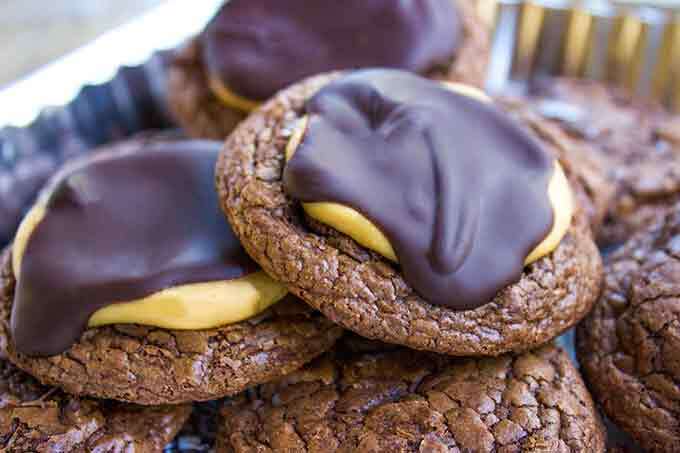 Crispy, chewy, rich Buckeye Brownie Cookies are the perfect chocolate peanut butter combo! 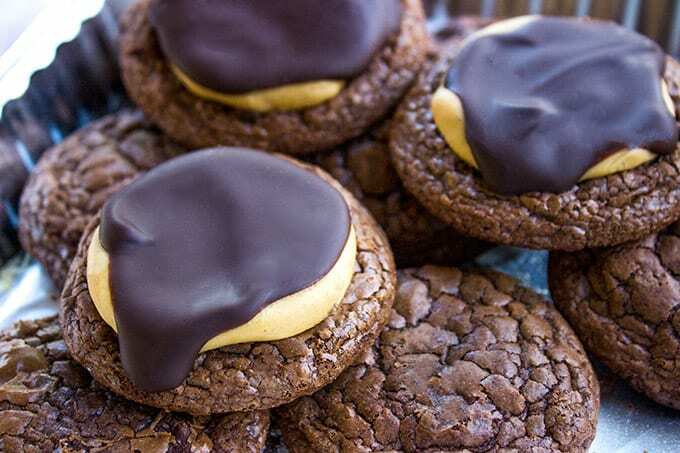 A while ago I shared my favorite new cookie, the Crinkly Brownie Cookie and today’s recipe is its more adventurous big sister, the Buckeye Brownie Cookies. With just a few more ingredients this elevates the brownie cookie to a whole other level. Up until the end of last year cookies were sort of hit or miss in our house. My oldest is a fan of salty/crispy/fried treats and my youngest wasn’t old enough to really eat anything other than purees. The last few months have changed everything! We are a veritable cooking making factory around here. You would think we were starting a new business, Cookie, then more Cookies and we can’t seem to keep enough of them around. When I made the brownie cookies my youngest grabbed the to go box of leftovers, cracked it open and was discovered minutes later completely COATED in chocolate. Buckeye might sound like a funny name but it’s a candy made of a sweetened peanut butter mixture (usually with powdered sugar) classically dipped halfway in chocolate. 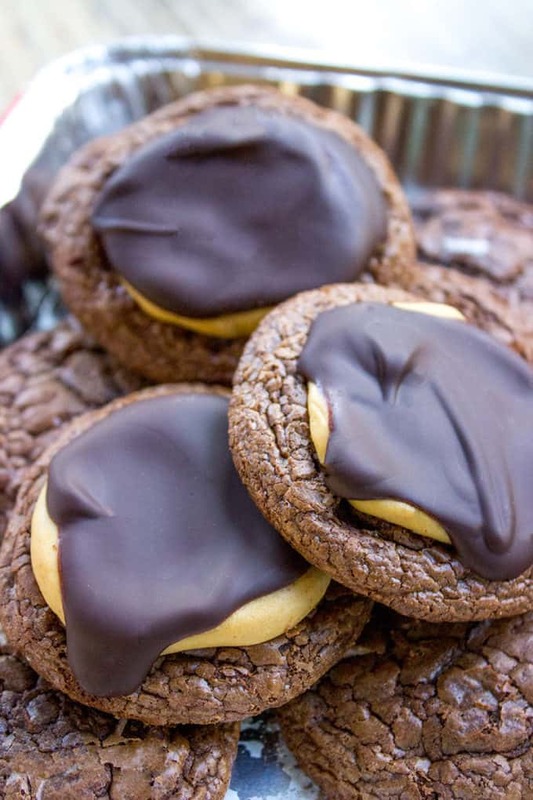 A buckeye cookie consists of a brownie cookie topped with the sweetened peanut butter and melted chocolate. Brownie cookies are made to have the texture of soft brownies with the rich chocolate flavor you love. Soft and chewy, when made best they almost fall apart upon biting and have a soft crackly top. How long will buckeye brownie cookies stay fresh? They will typically stay fresh in a sealed container for 3-4 days but can last up to a week when stored with a piece of sliced bread. Can I freeze buckeye cookies? Absolutely. To enjoy thaw them in the refrigerator before serving so the chocolate does not sweat too much in the defrosting process. The recipe is SUPER easy and quick, I actually use a meatballer (that name sounds awesome) to scoop the peanut butter quickly. I also usually use this for scooping cookie dough too and even falafel. The only thing I don’t normally use it for is…meatballs. Ha! 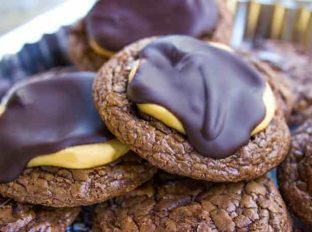 Crispy, chewy, rich brownie cookies topped with a sweetened peanut butter topping and semisweet chocolate is the perfect chocolate peanut butter combo! In a microwave safe bowl, add the butter and chocolate and microwave for 30 seconds. Stir and microwave a second time until completely melted. In a small bowl mix the eggs and sugar. Add them to the chocolate mixture and stir to combine. Add in flour and baking powder, stir until just combined. Refrigerate batter for at least 30 minutes, preferably 45-60 minutes. Scoop out cookie dough in 2 tablespoon sized balls. To measure accurately I used a coffee spoon. On a silpat put 6 cookies to a full cookie sheet. Mix the peanut butter and powdered sugar. In a small microwaveable bowl melt the semisweet chocolate in 30 second increments until fully melted. 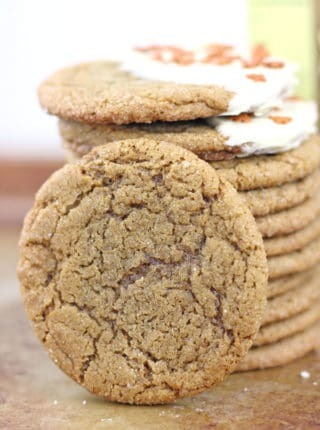 Add 1 tablespoon of the peanut butter mixture to the top of the warmed cookies and flatten slightly. When they come out of the oven they will look like little mountains, but when they cool they will deflate. I’m wanting to make these, but I don’t know what to use for the dark chocolate. What did you use? They look amazing! Thank you. I used Guittard dark chocolate bars but you can use whatever brand they have in the baking aisle. Enjoy! I don’t mean to be dense, but do you bake the cookies AFTER you put the peanut butter & chocolate on top? Before, sorry for the confusion. I love family recipes passed down! Such a great tradition! These look awesome! Do you think I can switch out the flour for all purpose gluten free flour? I am not a GF expert so I can’t answer that with any authority. I am not sure how GF flour works in baked goods. My gut would say I would think you should be okay, but I worry it may affect the texture in a way I don’t know. oh man I’m totally drooling! Yum. These look fantastic. I am really going to need to try these out. Oh my gosh these look amazing!! I love chocolate and peanut butter it’s the perfect combination for dessert! What a totally awesome idea – LOVE these!! These look SO amazingly good! You can never go wrong with peanut butter and chocolate, and it’s even better on top of a brownie cookie! I’m crazy for these! First, I’m originally from Ohio, so candy Buckeyes are a favorite (I don’t think you have a choice of whether or not you like Buckeyes if you live in Ohio 😉 But in a cookie version? Fabulous idea! These look so scrumptious, and of course a perfect flavor combo! Thanks Patricia, I love peanut butter and chocolate together too so these did not last long in the house! Buckeyes are a big deal in our house, they’re my husband’s favorite and always a hit when we have guests. I can’t wait to try out these cookies, I’m sure they’re bound to be a hit too. 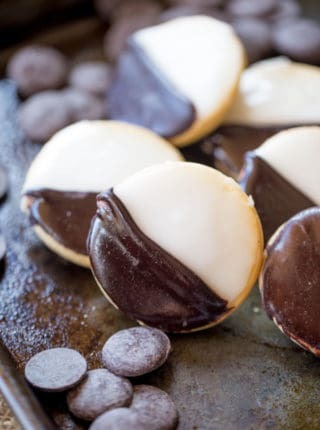 What a fun cookie that brings the love of buckeye candies to a different form. I bet my boys would love these. Oh those sure do look delicious! I love pretty much anything with peanut butter in them and then with chocolate, pretty much know they will be yummy! 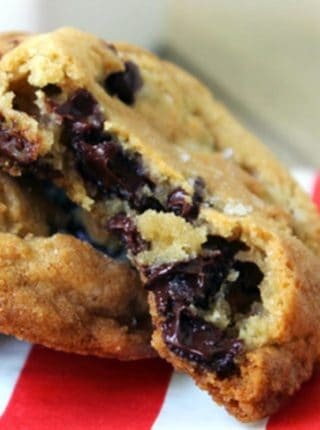 These cookies look so good, and who doesn’t like peanut butter and chocolate? I might have to make these and take to my next pot luck! 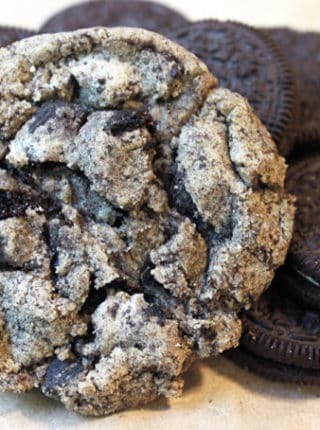 I want these right now. I love chocolate and peanut butter! I have lots of experience finding my kiddo quietly covered in food too. This sounds like a genius pairing! Brownie cookies and buckeyes, two of my favorite desserts. I think I’ll be baking these for the upcoming Spring potluck! Those look heavenly! Honestly, anything that combines chocolate and peanutbutter is a must have in my book!